We found it very delightful to bring our pups with us to wineries, breweries, and bars when we began camping and traveling a few years back. We enjoyed it so immensely, that we have pretty much made it our mission to find all the dog friendly watering holes wherever we go – especially in our home state, New Jersey. It’s a “ruff” job, but someone’s gotta do it, right?! As we shared posts on social media, we found out like ourselves, many others were unaware of just how many of these watering holes were dog friendly. This section of our website is meant to enlighten others of these dog friendly establishments and include some tips that will make your experience enjoyable. All of the dog friendly bars, breweries, wineries, and distilleries that we have visited with one or more of our pups will include pictures and links to the establishment’s website. If you use the drop-down arrow of this section in our main menu area, you will find sub-menus organized by state. We hope you will enjoy all of our “tasting” adventures, and discover some new places for you and your fur-kid to visit! Please remember that just like other activities, not every dog is meant to participate in these types of adventures. In fact, some members of our own pack do not go on certain outings with us unless we know they are a good fit for our destination. You know your fur-kid best. 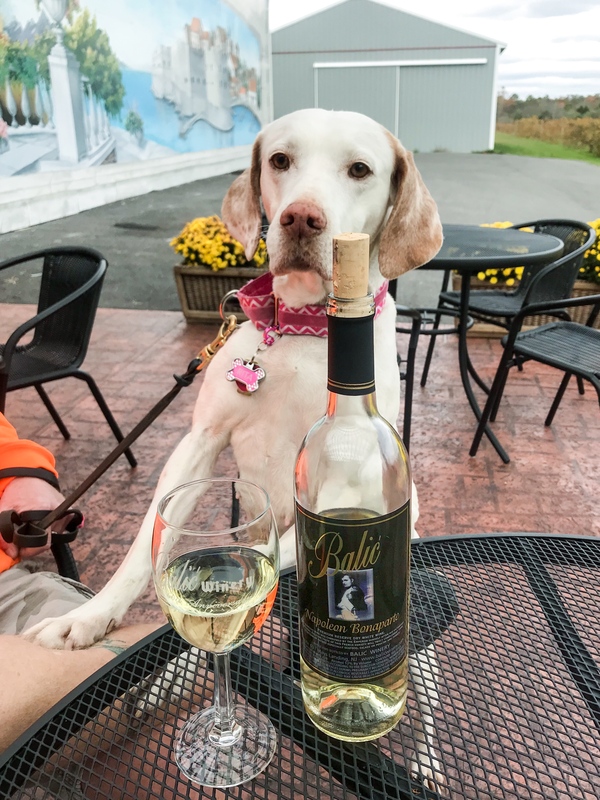 If you know that he or she “freaks” at the sight of kids, other dogs – or you have difficulty controlling any of the dog’s behaviors, wine and beer tastings might not be the best idea for your pooch. Here are just SOME of the tips we have become very familiar with to be sure not only you and your well-behaved dog have a good time, but also ensure other patrons enjoy your pup’s presence. Practice your dog’s obedience commands: Your dog should be able to execute commands including Sit, Down, Stay, Leave It, and Come. Once your dog can reliably perform these commands at home, take them outside in the yard and retrain the same expectations. If they do well with response in your yard, take your pup to a park or other public area that will have similar distractions as a winery/brewery/bar/restaurant to be sure that he/she can still focus on your commands with distractions in place. Exercise, feed, and potty your dog BEFORE you go: I can’t tell you how many times Brian and I use the saying, “A tired dog is a good dog!” Take a walk or run, play fetch, or practice your commands (yes, mental exhaustion is good too!) until your pooch is dawg-tired. Don’t forget to get your dog to do their “business” before you enter an establishment -and be sure to bring spare poop bags just in case. Feeding your dog before arriving to you destination may reduce any begging or interest in someone else’s food. Pack a “Doggie Bag:” (Think Diaper Bag): We use a backpack so it’s easy to carry and is hands-free. In this bag we pack a portable water bowl, a portable food bowl, bottled water, treats, accident clean-up items (travel-sized Nature’s Miracle, paper towels, rubber gloves, poop bags), dog-friendly bug spray, and any other items that may be helpful – such as a rain coat or winter coat in case of any unforeseen weather changes. Be sure your pups are up to date on shots and flea meds: Your dog might encounter other doggie patrons, so make sure your dog has had his monthly flea and tick preventative, and is up-to-date on shots. Call ahead: Even if you have heard a place is dog-friendly, call ahead to be sure that they are in fact dog-friendly, and that their policy didn’t change. You are also going to want to make sure you ask if dogs are allowed inside, on the patio area, or in another designated area. Keep your dog leashed at all times: Always…PERIOD. Also, be sure to have a collar or harness on your dog that fits appropriately, and also had an ID tag in the event your pup accidentally slips away from you. Choose an appropriate seat or table: Keep your pup out-of-the-way of patrons and staff. Ask your server or winery/brewery host for a corner table or a seat in an area you think you’d best be able to have best control of your fur-kid. Be mindful of finding a shady spot if you are sitting outside in warm weather. Tying your dog to the chair or table is not a good idea – always hold their leash so that you can be in complete control, and able to protect your pup from something dangerous. This will also allow you to keep your pooch near you – not everyone wants to interact with your dog – – and there may be other people or dogs that YOU don’t wish to have your dog socialize with. Be honest with others: Don’t be afraid to lay the law down in order to protect your dogs and others. Let people politely know if your dog prefers not to get up-close-and-personal with small children, other dogs, etc. You never know where these pups will take us next – we’d love to hear of any dog friendly watering hole that you have visited – comment below with the info and we will add it to our “must visit” wish list! ***Establishments we share in this section, along with the tips we have included above are meant only as advice and recommendations based on our own experiences. As always, if at any time you feel as though you and/or your dog are stressed, or the place you are visiting doesn’t seem like a good idea, just politely notify your server and safely remove your pup from the situation. Remember that alcoholic beverages are for the “of age” humans in your pack ONLY. It is also very important while are visiting these types of establishments to drink responsibly and have a designated driver in order to ensure you and your pup have a safe adventure.